Presidency Council (PC) head Faiez Serraj has warned the international community of political failure unless it intervenes to stop the fighting in the south of the country. 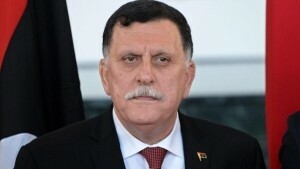 In a letter to the UN, EU, Arab League, Africa Union and the Organisation of Islamic Cooperation, he said the deteriorating situation in the south “threatens everything that has been achieved on the path of national reconciliation and stability in Libya”. Serraj said he was writing in response to the sudden and unjustified escalation in fighting. He made clear he was referring to the LNA air attacks on the Tamenhint airbase but he also mentioned an “heavy artillery” attack. These, he warned put the country on the brink of a civil war which should be avoided at all costs. He said he hoped that the international community would intervene quickly to stop the wrecking of security and stability, which would jeopardise the political process and lead to a civil war the outcome of which could not be known. “From the beginning I promised myself not to be the cause of war between Libyans. I will not be a party to that. But the war that I will not hesitate to fight is the war against terrorism”. Serraj did not spell out in what way the international community might be able to intervene.